* Baked on paint for years of maintenance free beauty. * Four concealed bronze oilite bearing & steel pin hinges for extra strength. * Door never sags...Corners are part of unique one piece rail frame. * 1 1/4" thick for strength and the feel of real luxury. * Striker plate factory installed to save you installation time. * Pre-installation with drilling, spacing, mounting finished. * Totally weather-stripped to keep weather out. * Adjustable for varying heights. * Tempered Glass is easy to replace. 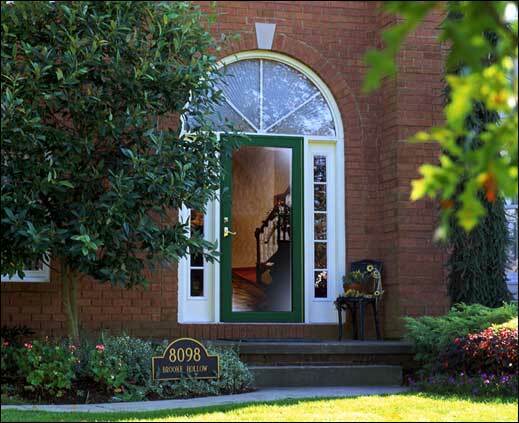 Affordable Exteriors will enhance the beauty and privacy of your front door with an elegant glass aluminum door. 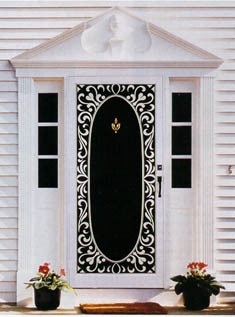 Doors also available with screen insert. The styles displayed are backed up by a lifetime limited warranty so you can be assured of quality.